It’s all too common for homeowners to not think about the plumbing problems that their home might face, until it’s too late. Things like a cracked or leaky pipe, or a backed-up drain, can have catastrophic effects on your home, and have immense financial consequences as well. The great news is that these things can all be easily prevented, through regular plumbing inspections by a qualified plumber. Having a professional at True-Pros inspect your pipes can ensure that the condition of your plumbing stays in tip-top shape. 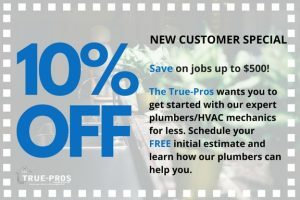 If you need a plumbing inspection, call True-Pros today! Don’t wait until you have a problem to get an inspection done. Act now to prevent time and money being spent on a larger issue that you can catch today. The costs today of fixing a leaking pipe could save you thousands in the future. Our professional, experienced staff always arrive a time that is convenient for you. We guarantee your satisfaction on the quality of our work, and offer extended warranties to make sure your plumbing continues to function properly.